The new Robert D. Love Downtown YMCA in Wichita, KS, contains more than 50,000 square feet of mosaic and large format tile. The 110,000 square-foot LEED-Certified YMCA features large format porcelain tile on its lobby floor, ceramic and porcelain tiles throughout the building and porcelain mosaics in its pools, whirlpool and steam room. For the job, installer Fox Ceramic Tile used TEC products to address each space’s unique demands, including time constraints and exposure to heat and harsh chemicals. In the wet areas of the building, HydraFlex Waterproofing Crack Isolation Membrane protects the substrates of showers, steam rooms and saunas. AccuColor EFX Epoxy Special Effects Grout was used in these areas for its extreme heat, stain and chemical resistance. "We were confident that TEC products would hold up to the environmental challenges that showers, steam rooms and saunas present,” says Kevin Fox, owner of Fox Ceramic Tile. 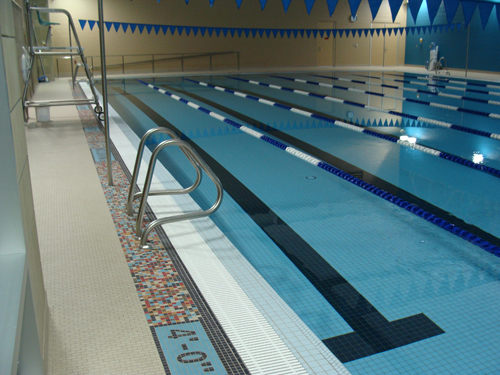 The locker rooms and pool deck have 8,300 square feet of running bond mosaics that also face moisture and chemicals. Full Flex Mortar was selected for use in these areas. The building’s high-traffic corridors, which feature large format tile, posed another type of challenge to installers. The tile had to be installed and set quickly to allow other trade workers access to them. "Fast Set Ultimate Large Tile Mortar allowed us to quickly complete installations in critical areas like the corridor, which we had to rapidly turn over to other trades to meet the owner's aggressive timeline,” says Fox. 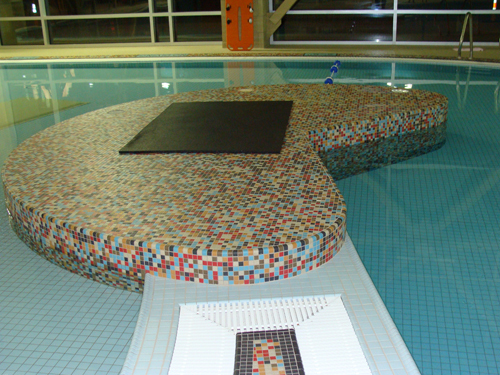 Ultimate Large Tile Mortar was used with large format tile in less time-critical areas. Power Grout was used in all grouted spaces in the facility that are not subjected to harsh chemicals and provided several advantages. TEC AccuColor 100 100% Silicone Sealant was used to caulk each tiled area of the YMCA. This product provides a flexible, long-lasting and water-resistant seal. Kevin Fox, of Fox Ceramic Tile, was the grand prize winner of our "Imagine Achieve" contractor contest for this YMCA installation. Congrats Kevin!